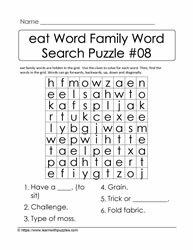 How do puzzles support students in their learning? 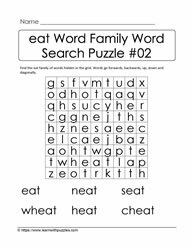 Puzzles support student learning by engaging their brains in an activity that encourages self-directed learning. 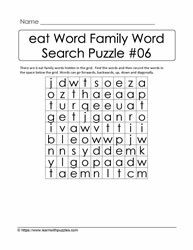 For example, word search puzzles help to introduce new concepts, new vocabulary, as well as reinforcing previously learn concepts. 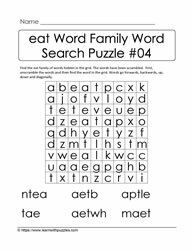 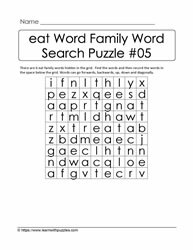 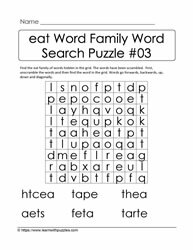 This eat word family and rhyming words category of puzzles supports students' growth and development of vocabulary building skills. 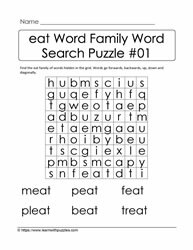 Puzzles increase in complexity as they move from the basic word search puzzle where the list of words is included, to the word search where the list of words is scrambled, followed by a puzzle where there are no words listed. 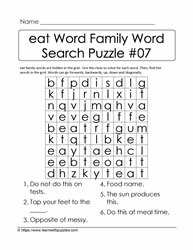 A final section of this group of puzzles is a brain teaser where students need to solve crossword like clues before locating the hidden words in the grid.